The field is being developed by a consortium led by Total, which holds a 50% interest and serves as the operator, while other development partners include Gazprom (20%), Tecpetrol (20%) and YPFB Chaco (10%). First production from the field was achieved in September 2016 at the rate of 50,000 barrels of oil equivalent a day (boe/d). The field is expected to achieve a daily production capacity of 6.5 million cubic metres by the end of 2016. "The field is expected to achieve a daily production capacity of 6.5 million cubic metres by the end of 2016." Development of the Incahuasi project enables the Bolivian Government to upgrade its natural gas reserves to meet domestic demand, as well as fulfil export contracts with Brazil and Argentina. Discovered in 2004 with the drilling of the ICS-X1well in the Ipati block, the Incahuasi field is a north-south oriented structure located at a depth of 5,600m under the Andean foothills. It contains gas in the Huamampampa fractured sandstones reservoir of the Devonian age. Recoverable reserves of the field are estimated to be 70.8 billion cubic metres of gas, and 4.8 million tons (Mt) of gas condensate. In May 2009, Total drilled an exploration well, AQI-X1001, which encountered gas and condensate in the Aquio block. The well confirmed the northern extension of the Incahuasi field. Tests conducted on the well resulted in the production of gas and condensate at initial rates of over 500,000m³/d and 500 barrel a day respectively. Total drilled a second exploration well, ICS-2, in September 2013 in the Ipati block. Drilled to a depth of 5,636m, the well encountered a hydrocarbon column of approximately 1,100m. Total made the final investment decision for the development of the field, based on the results of the exploration well. 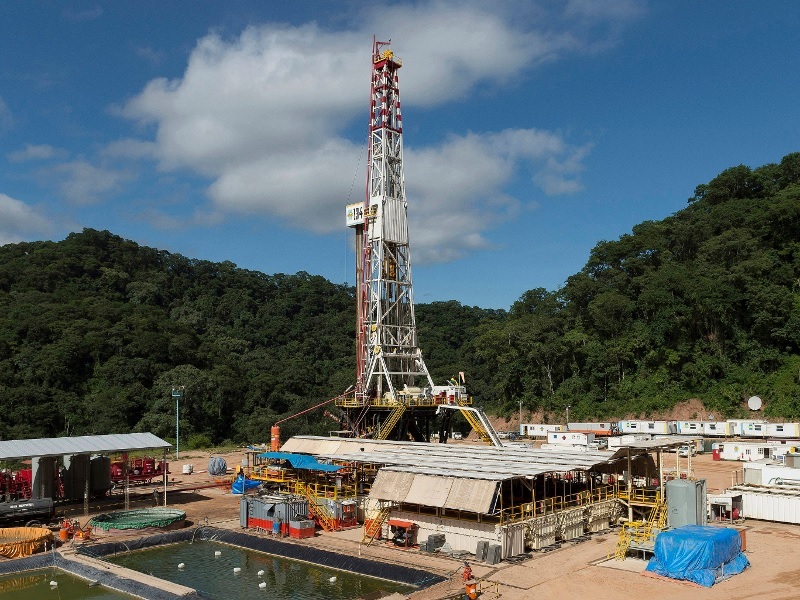 The Incahuasi field is being developed in phases, with the first phase involving the construction of three wells including one in the Aquio block (AQI-X1001) and two in the Ipati block (ICS-X1 and ICS-2). A gas treatment plant, an in-field pipeline system and a production control system are also part of the first phase of the project. A 140km-long pipeline was laid to transport the gas produced by the Incahuasi field to the Bolivian trunkline system. The pipeline included 103km of 30in-diameter gas pipes, 22km of 10in-diameter flowlines and 17km of 8in-diameter condensate pipes with regulator stations along its length. The terrain of the project presented challenges for the developers. Construction of the pipeline required laying of pipeline sections through steep hills with inclines that exceeded 30°. The second phase of development will involve the drilling of three more wells. Técnicas Reunidas conducted the front-end design and engineering study for all the facilities of the first phase of the field development. Total awarded the engineering, construction, testing and commissioning contract for all facilities of the first phase of development to TECNA. GE Oil & Gas supplied its single-stage integrated compressor line (ICL) units for a new compressor station at the field. Grupo Cuñado supplied 30,000t of 30in-diameter pipe required for laying of the pipeline. Entrepose Contracting (VINCI Construction) subsidiary Spiecapag won the contract to design and build the gas pipeline for the project. It also carried out commissioning works of the infrastructure that connects the field with the Bolivian trunkline system. Dietsmann was awarded a 15-month maintenance engineering contract for the project.